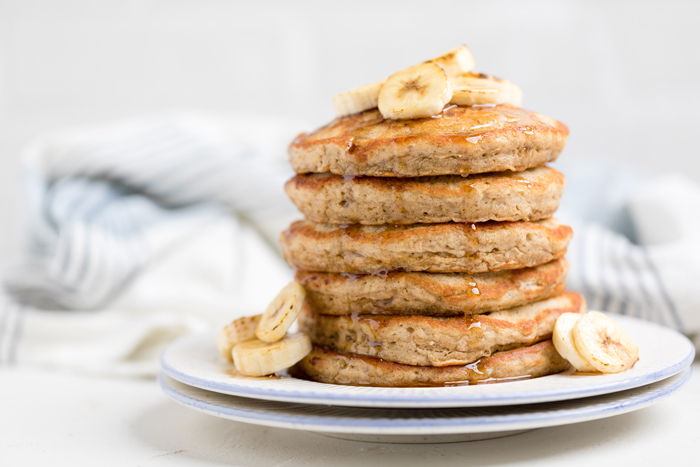 These vegan banana pancakes will become your favorite breakfast every weekend! These are dairy free pancakes, as well as egg free and insanely fluffy! Just because you live a dairy or egg free life, whether by preference or for allergic reactions, you deserve to have high quality food, nonetheless. And everyone deserves a delicious and filling breakfast. Whether you are hosting a holiday breakfast or brunch or making breakfast for dinner, a recipe for delicious dairy free pancakes are just what you need. 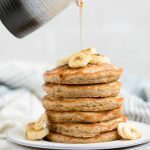 These vegan banana pancakes are one of the easiest and best vegan breakfast recipes you can try! 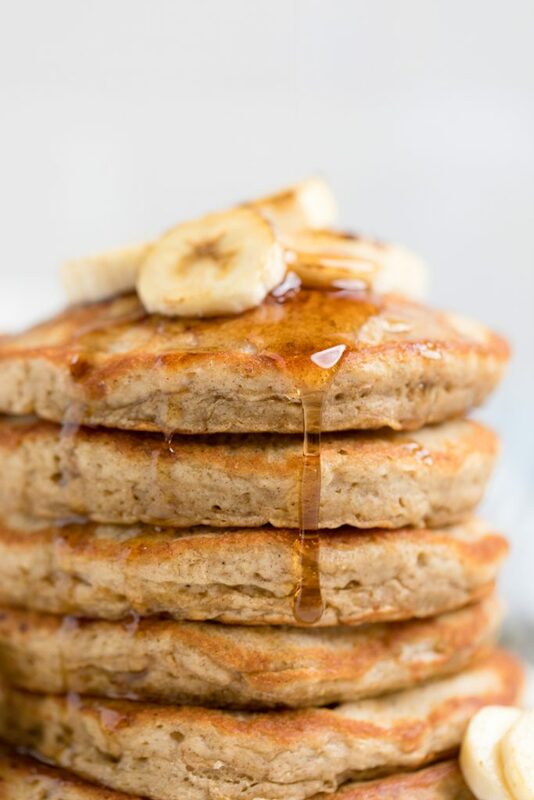 These dairy free banana pancakes are perfectly fluffy all while not requiring eggs or milk. You need just 10 ingredients and a few minutes and you will have the most delicious vegan banana pancakes. What ingredients do you need to make Vegan Banana Pancakes? Almost, if not all, of these ingredients should be in your pantry already. If you don’t have one, they can easily be found at your local store. 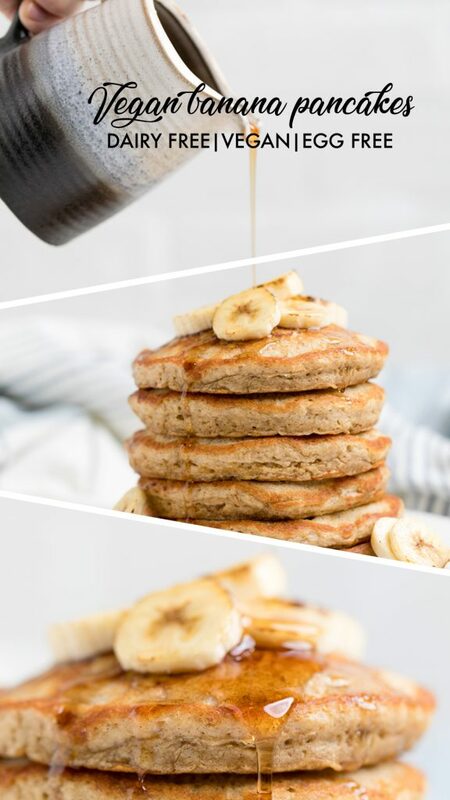 How do you make Vegan Banana Pancakes? The first thing that you need to do to make these vegan banana pancakes is combine the vinegar and dairy free milk. Let this sit for 10 minutes. Doing this makes vegan buttermilk. While you wait for that to sit, in a large bowl add all the dry ingredients. Mash the bananas on a plate. Add the buttermilk to the dry ingredients once ready and combine well. Then, add in the mashed bananas and vanilla and combine well again. Add a small amount of dairy free butter to a skillet over medium low heat. Add 1/2 cup of pancake mixture to the skillet. Wait until bubbles start to form and flip. Cook other side for 1-2 minutes or until golden brown and remove. Repeat until no batter remains. Serve topped with butter, syrup, or any of your favorite sauces! Tip: Place an oven safe dish in the oven at the lowest temperature. Place pancakes on the dish after cooking to keep the pancakes warm while you cook all of them. Can you freeze Vegan Banana Pancakes? You can absolutely freeze these vegan banana pancakes. 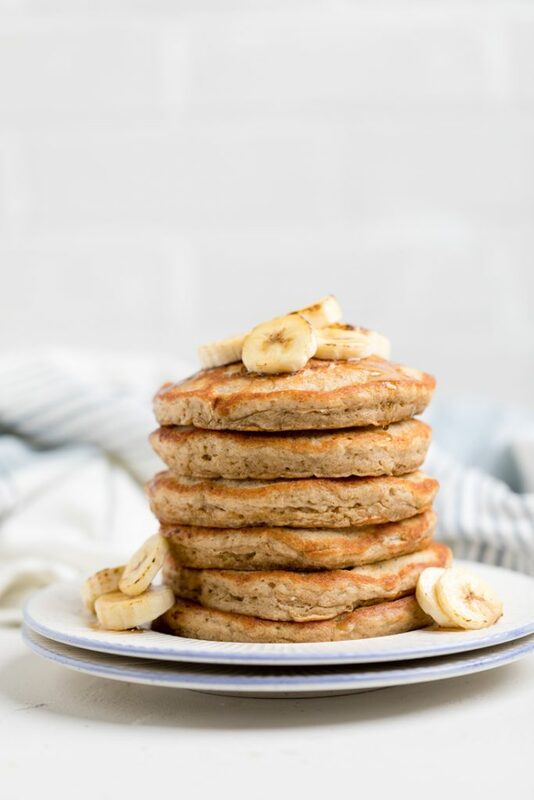 Wait until they are completely cooled and then we suggest freezing these vegan banana pancakes on a baking sheet for about 30 minutes to flash freeze. Then, put the pancakes in a freezer container or zip-loc bag. Can this Vegan Banana Pancakes recipe be Top 8 Allergen Friendly? 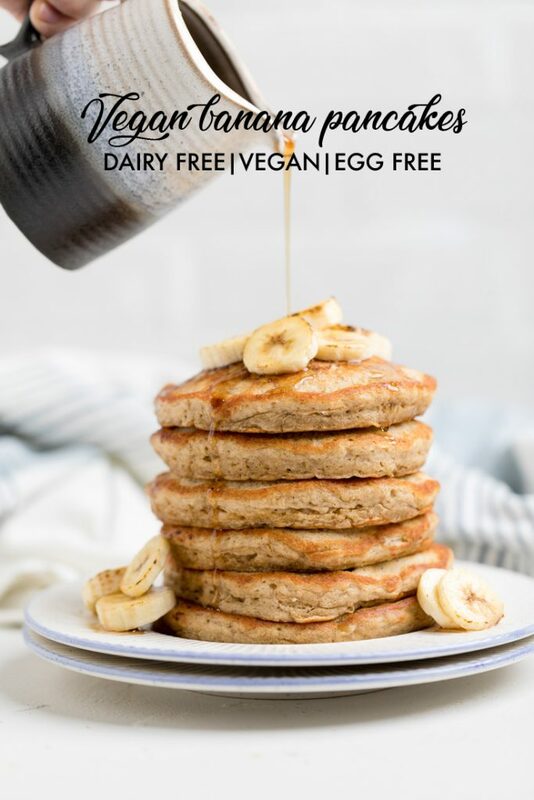 These vegan banana pancakes are already very allergy friendly; however, they do contain wheat in the form of flour and we use almond milk for ourselves. If you need this recipe to be completely allergen friendly in regards to the Top 8 allergies, we would suggest that you switch the flour for gluten free cup for cup flour. And replace the almond milk with a safe dairy free alternative milk that your family loves. Doing these 2 simple switches will make these vegan banana pancakes Top 8 allergy friendly. 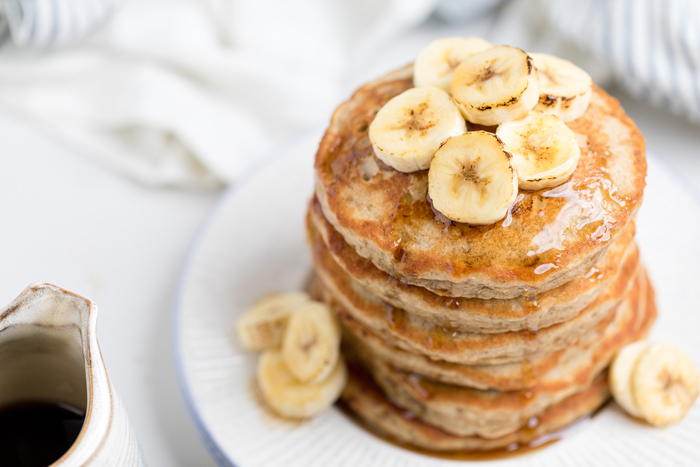 WHAT ARE TOPPING IDEAS FOR VEGAN BANANA PANCAKES? What are other dairy free breakfasts to try? 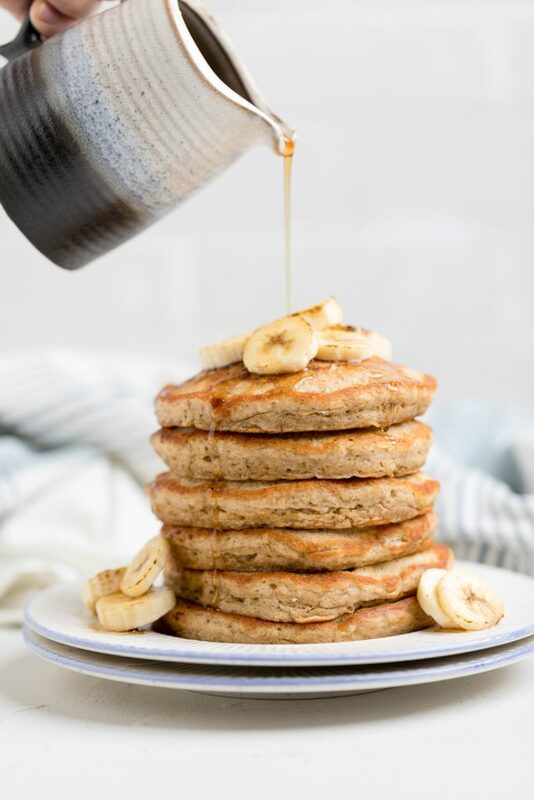 Once you try these amazing vegan banana pancakes, you’ll definitely be wondering what you should try next. Here are some delicious dairy free breakfast recipes that you should absolutely try on your next day off or free day! All these recipes are vegan/plant based. Add the buttermilk to the dry ingredients once ready and combine well. Add in the mashed bananas and vanilla and combine well again. Add a small amount of dairy free butter to a skillet over medium low heat. Once heated, add 1/2 cup of pancake mixture to the skillet. Wait until bubbles start to form and flip. Cook other side for 1-2 minutes or until golden brown and remove. Serve topped with butter, syrup, or any of your favorite sauces! See post for ideas. *The more ripe your bananas, the sweeter the pancakes will taste.